Dr. Charles Stone has been a student of the brain for a dog’s age and written on neuroscience across fields. It turns out, understanding human nature, physiology included, outlines a path into practices that promote make your life better. We know: not exactly a surprise but it got us thinking. Anyway, it turns out mindfulness, or being present to God in your moment, is a Christian discipline with roots reaching back millennia. 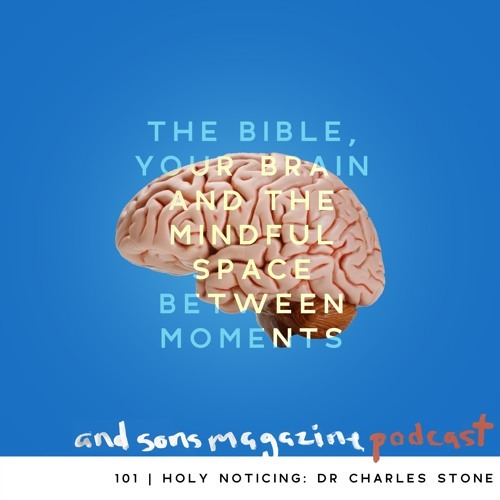 In our conversation, Dr. Stone outlined a mindfulness practice that produces practical relief like happiness, gratitude, an experience of the presence of God, empathy, etc, as well as complex stuff like cognitive reserve, new neurological defaults, and a diminished fear response. One more thing. Get this: in a brain study on nuns, researchers found that nuns experienced Alzheimers and dementia about as often as other people. Surprise surprise. BUT: you wouldn’t know. The nuns didn’t show symptom of either. That’s because they had healthy brains, cultivated through practices like mindfulness and contemplative prayer and statio. When parts of their brains stopped working, other parts took over. It’s called having strong cognitive reserve, and the point is, take care of your brain now, and you’ll thank us later.